Of all our weekends doing house projects, nothing has fueled more productivity than our house warming last weekend. We sent out the Evite a month in advance and that party date acted as our deadline to wrap-up our half-finished DIY endeavors. A flurry of building, hanging, and cleaning ensued but the item we are most excited to have ticked off the list is undoubtedly the window frames. I saw the idea to turn old windows into picture frames in Ty Pennington at Home last summer but never really thought about doing it, until I saw this rugged stack at our trip to the Old Country Store in Rhinebeck, NY. A set of them suddenly seemed like a quirky but efficient way to tame our massive photo collection. 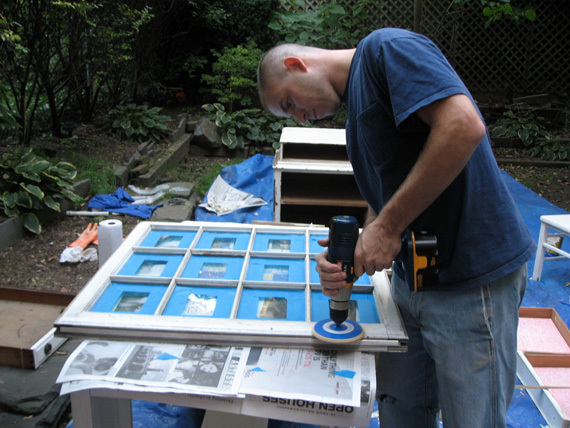 We started the process of prepping the windows during out 48-hour furniture-refinishing weekend. 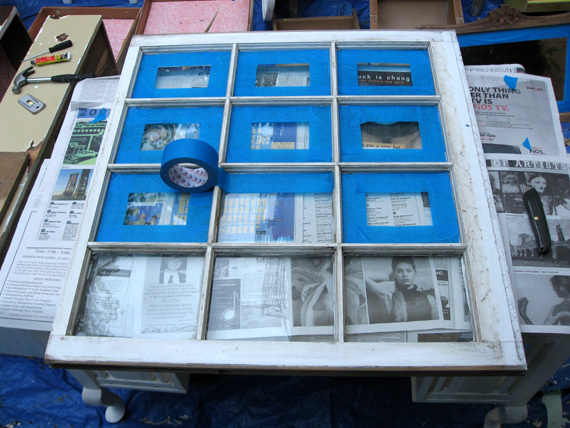 Here, we taped up the windows to prevent the new coat of paint from dripping on the glass. We sanded them down to help get off any grime and create a smooth surface for the paint to adhere to. Then we added a fresh coat of white and voilá, we had two 12-photo frames. In digging through years of photos, we skipped over the posed shots and compiled our best collection of art, adventure, and laughs. We printed the pictures at home, cut them to size with a paper cutter, and taped them into each pane. We hung each on either side of our living room archway and they have made me smile every day since.